Gray whales have the longest known migration of any mammal. They travel 10,000-12,000 miles round trip every year between their winter calving lagoons in the warm waters of Mexico and their summer feeding grounds in the cold Arctic seas. Each spring, some 20,000 Gray whales travel past the western shores of Vancouver Island, past Tofino. 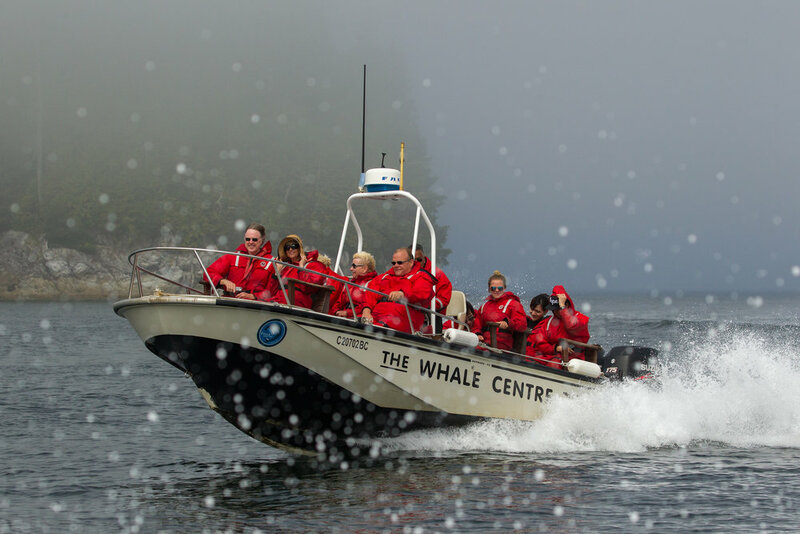 The 30-ton giants can be seen on Tofino Whale Watching Tours, as early as February, with females and calves passing by from mid March, through April and into early May. The whales are known to feed in the sheltered bays near Tofino beginning in March. Often Gray Whales will stay in the area for the summer to feed. The Gray Whales return in the fall by the same route to their calving and wintering grounds in the warm-water lagoons of Baja California in Mexico. Adult grey whales can be as long as 15 metres and weigh up to 35 tonnes. Instead of teeth, gray whales have baleen, which is like a thick comb made up of long, fine hairs. Diving to the muddy bottom, grey whales scoop up sediment from the ocean floor, filtering out water and mud and trapping plankton and krill. Grey whales are, well, grey with whitish blotches. And they come with hitchhikers. The skin—especially around the head, flippers and tail—is home to clusters of round, white barnacles. Crawling among them are orange whale lice—each about the size of a large thumbnail. Up to 100,000 lice have been found on a single whale! During this migration trip the gray whale travels at an average speed of around 5 mph for two to three months until it reaches its destination. Research has shown that the age of a Gray Whale isn’t the only distinction for its reproduction. The average age is 8 years for the males and females. However, those that have reached a length of at least 36 feet may be ready to reproduce at a younger age. Gestation takes just slightly over a year before the baby emerges. A newborn can weigh up to 2,000 pounds and be more than 14 feet long. This nursing/feeding period for the baby whale lasts for about 6 – 8 months or until lactation stops. In terms of lifespan a healthy gray whale is estimated to an average lifespan of 50 – 70 years. Grey whales were hunted extensively and almost driven to the point of extinction, but now represent a rare success story for marine mammal conservation. We see Grey Whales in Tofino almost year round. We have seen Grey Whales on our Hot Springs Tours in January and February. The scientific name for the gray whale is, “Eschrichtius robustus”. The Whale Centre offers Whale Watching Tours to see the Gray Whales from March to October.